Events over the weekend revealed divisions in Europe, as a German coalition came together and the Italian public embraced a populist revolt against the status quo. After months of tense negotiations where a positive outcome seemed doubtful, Germany’s Social Democratic Party under Martin Schulz voted in favor of a grand coalition with Angela Merkel’s Christian Democratic Union. The move means Mrs Merkel will carry on in charge, on top of the 12 years she has already served. In contrast, Italy faces a prolonged period of instability after voters delivered a hung parliament in yesterday’s national elections, in which the anti-establishment Eurosceptic Five Star Movement won 31 percent of the vote, with a major defeat for the ruling centre-left coalition on 23 percent. The outcome of national elections in Italy are another blow to the European Union, especially given that Silvio Berlusconi’s Forza Italia in coalition with anti-migrant parties including the Northern League claimed a whopping 37 percent of the vote. Berlusconi is seen with contempt by many European bureaucrats over his warm relationship with Vladimir Putin. It is an outcome which lawmakers in Brussels will want to sweep under the carpet and ignore in the face of rising Euroscepticism across the continent. As we have detailed on previous occasions, anti-EU sentiment is growing not only in Italy but in Austria, Poland, Spain and even within Germany itself, where the AfD (Alternative für Deutschland) has boosted its ranks in the Bundestag, after it became the third-largest party in Germany after last year’s federal election. In 2017 it seemed to many that the rising tide of populism had been blunted, after 2 eurosceptic right-wing politicians in Europe – Marine Le Pen in France and Geert Wilders in the Netherlands lost to left-leaning opponents in national elections. However, the continent is still reaping the impact of the migrant crisis which began in 2015, and the connection between this problem and the rise in right-wing sentiment is too closely related to be ignored. Angela Merkel faced huge backlash for allowing over 1 million undocumented migrants to enter Germany in the space of a single year, which directly led to the AfD’s ascension into the mainstream. Heads of state in Europe have seemingly underestimated the massive problems they caused with overty liberal migration policies and the social cohesion issues this brought to the fore for regular citizens. It is clearly for this reason that so many people are voting to the right. In the past 7 years, more than 750,000 migrants have crossed the Mediterannean to the Italian island of Sicily, though this increased rapidly in 2017 with up to 10,000 arrivals taking place in some 3-day periods throughout the year. Berlusconi pledged to deport 600,000 illegal immigrants from Italy if his centre-right coalition enters government, and has said that immigration was a “social bomb ready to explode in Italy”. Policies such as this would be anaethema to politicians elsewhere in Europe like the U.K. but the clear public support for his plans in Italy reveals the very real extent of the problem and the changing sentiment of European citizens towards migration. 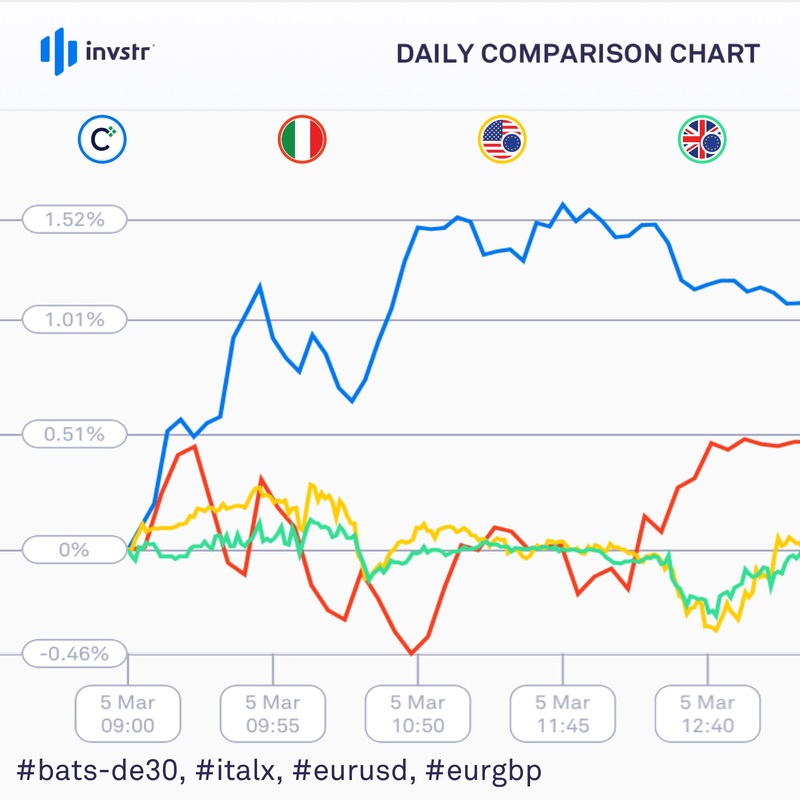 In response to the action over the weekend, German markets got a boost, while Italian stocks fell at the open and the Euro made losses against the Dollar and Pound this Monday. Today’s market action in Europe: Germany gains, Italy loses (though reaction is more tepid than expected), Euro dips.